Anne Curtis is totally beasting it out these days with her workouts. A peek at her Instagram stories will show you just how much she's exercising each day to keep strong and fit, and because of this, boy, are we inspired to hit the gym! If Anne can get super toned in three weeks, so can we (at least we can try!). Anne even held a workout party on her 34th birthday, which just goes to show how much she's dedicated to staying in shape. Most of the time, we see her with workout buddy Isabelle Daza (who lost 68 pounds in 10 months, by the way), doing circuit exercises under the program of their personal trainer, Arnold Aninion. 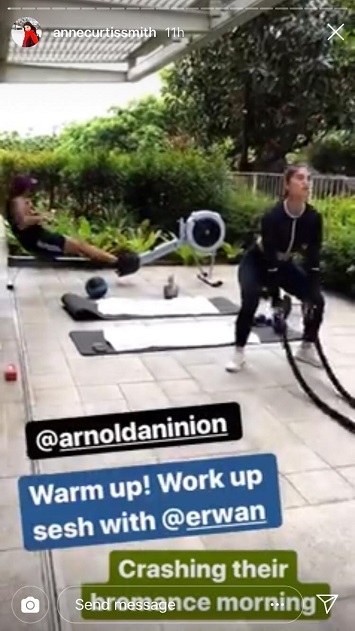 Other times, her hubby Erwan Heussaff joins in, and today, he totally poked fun at Anne in the middle of a workout. Celebs they may be, it's nice to see their playful behavior come out every now and then. Here, we already see a hint of the charming banter between the husband and wife, as Anne jokes about Erwan's "bromance" with Arnold. Next, she points out how Erwan's not squatting as low as he should. Here's the best part. Erwan pulls up his top and gives it a tuck to expose his tummy, while we hear Arnold muttering, "Oh my gosh. Dude. No, dude." Anne posts the clip with the caption "Triggered lolo mo!" 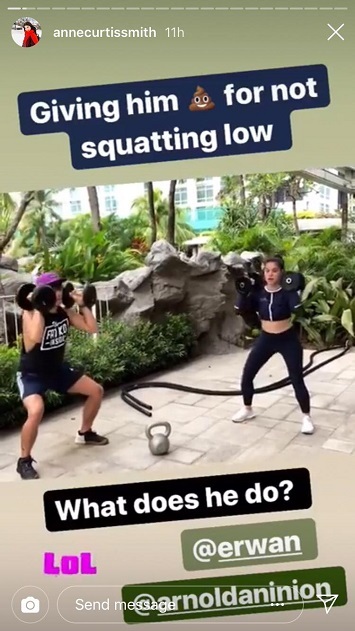 as if to suggest Erwan was getting back at her for pointing out his not-so-low squats. 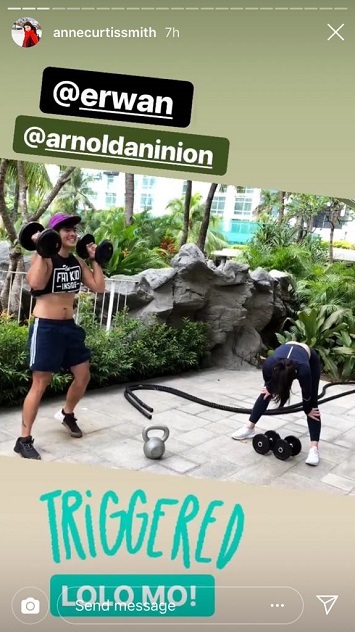 We love seeing these light, funny moments between Erwan and Anne, and thankfully, you can still catch this clip because Anne has added it to her "WORKOUT" Instagram highlights. We're looking forward to seeing more of them teasing each other!